At the industriAll Europe Executive Committee in June 2017, all affiliated organisations endorsed the resolution on the ETUC Pay Rise campaign. The ‘Work Place Week’ is the part of the ETUC campaign delegated to European Trade Union Federations and national affiliates of the ETUC. During the week industriAll Europe will be sharing worker testimonies about the situations faced by workers across Europe, including the situation of collective bargaining in their countries, purchasing power and why pay rises are needed. 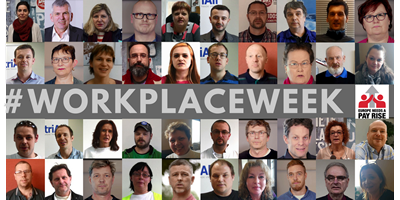 The workplace week of action aims to raise awareness and engage discussion at national and European level around wage issues, more specifically on pay rises to boost purchasing power and uphold European economic growth. The ultimate objective is to change workers' beliefs that a Pay Rise is unrealistic and to restore confidence so that they turn to their employers and government to demand a Pay Rise. Read the resolution of the industriAll Europe Executive Committee here. Find out more about the Pay Rise Campaign here.